It’s estimated that there are more than 7.5 billion people alive in the world today. A person born in 1960 has seen the global population more than double in the time they’ve been alive. The world population is expected to peak at around 9 billion in 2070, and it will be a serious challenge to keep that many people fed, clothed, and housed. Beyond this, though, people deserve an opportunity to have more than just the bare necessities of life. Providing all the products that are part of a full and modern life to many more billions of people simply isn’t possible with today’s business models and supply chain. There is simply too much material and energy waste for our current model to scale for that population size. What this means is that we need to look for a range of new approaches that can make better use of our resources. 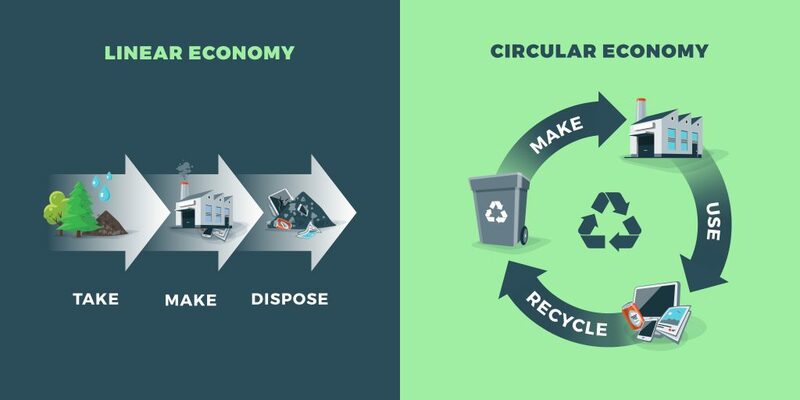 Strategies like a circular business model offer ways of making better use of the materials and energy we already have. By improving the efficiency of the supply chain, we can expand the benefits of modern life to all of mankind–from the present populace to the peak population of the future. Single Channel: The linear business model is concerned only with the production-to-retail channel. Overwhelmingly, the flow of products is one-way, from the manufacturer to brick-and-mortar retail outlets. Top-Down Decision-Making: Decisions about what products are developed and enter full production and about which retail partners will be able to sell those products are made in a top-down manner by a small board of executives with very limited input from consumers and other employees. Driven by a Single Goal: The goal in a linear business model is to maximize profits by getting products into the hands of consumers for the lowest price possible. Efficiency can be a consideration in this model, but if reuse, recycling, or movement to a new location costs more than disposal, then otherwise perfectly usable goods will be discarded. The goal in a platform business model is to offer many products to meet many types of demand through as many channels as possible. The linear model of business is dependent on a plentiful supply of energy and raw materials to produce more products than are truly needed in order to reap the benefits of economies of scale. Interruptions, challenges, or mistakes are made up for by sheer volume of product, which leads to a great deal of waste. However, the ability to gather and transmit large amounts of data instantaneously has enabled the ongoing development of new business models, such as the platform model. Omnichannel Availability: The focus of a platform business model is to provide a product or service through as many channels as possible to maximize consumer access and convenience. Instead of a production-to-retail pipeline, there are multiple single transactions between producers, consumers, and retail partners. Consumer Participation: Businesses that are based on a platform model are much more reactive to consumer demands or complaints. Consumers may actually get to participate in decisions about what products or services a company will offer. Multiple Goals: The goal in a platform business model is to offer many products to meet many types of demand through as many channels as possible. Consumers can initiate a transaction whenever and through whatever means is possible. The platform model has a significant disadvantage in the way it creates inefficiencies in transportation. The platform business model is responsible for the meteoric rise of online giants like Google and Amazon and the sudden faltering of traditional retail outlets. This model has the advantage of tight coordination between production and consumer demand. “On demand” and “just-in-time delivery” are in many ways bywords for this business model. The platform model can also reduce waste by helping products find their market. However, it also has a significant disadvantage in the way it creates inefficiencies in transportation, as many single units may be shipped in separate trips instead of all at once. These two models each offer advantages and disadvantages, but the plain truth is that they both use far more materials and energy than we can afford moving forward. It is clear that we need to make better use of what we have in order to ensure that economies and populations continue to thrive. The developing circular business model aims to be that solution. What Is a Circular Business Model? To use as few resources as possible to produce products. To extend the lifespan of products as much as possible in order to get the most use from them. To reuse or reclaim the materials used in manufacturing. It’s not an easy task for a business operating on either a linear or platform model to do these things. Out of long habit, consumers are conditioned to expect the durable products they buy to become obsolete after a couple of years. In the grocery industry, perishable goods like produce aren’t reclaimable for anything except fertilizer. Many other industries would need to completely rethink the way they do business in order to build a circular business model. One big source of supply chain waste can be eliminated through the use of a pallet pooling program. However, businesses can make a few simple supply chain choices that can begin to close some loops. Packaging, like cardboard and plastics, can be reclaimed for recycling and reuse. One big source of supply chain waste–the wood shipping platforms that are often used once and then discarded–can be eliminated through the use of a pallet pooling program. A pallet pooling provider distributes pallets as needed to clients and arranges for the reuse of those pallets without the inefficiencies that occur when a company tries to retrieve its own pallets from retailers. Pooled plastic pallets take things a step further, enabling more efficient, sustainable supply chain management. Plastic lasts a very long time, and plastic pallets have a life cycle that is far longer than even the sturdiest wood block pallet. Even more importantly, plastic pallets offer true cradle-to-cradle recyclability. A high-quality plastic pallet at the end of its useful working life can be ground down and remade into another plastic pallet–this is just one of many advantages that plastic pallets have over wood ones. In fact, plastic pallet pooling is one of the very few fully circular models that is currently in actual use. Not only does a plastic pallet rental program provide an example of what a truly circular business model could look like, it also opens up a way for businesses that are still using linear or platform models to end a major source of waste in their supply chain. The iGPS pallet pooling program offers a fully recyclable plastic pallet that helps reduce waste in the supply chain and save businesses money. To switch to a reusable rental pallet that makes better use of resources, give our team a call at 1-800-884-0225, email a specialist at switch@igps.net, or visit our contact page.